Just received this adorable stamp in the mail and couldn't wait to ink it up. 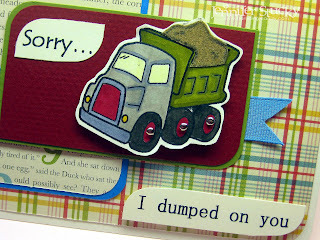 Isn't this dump truck stickin' cute? 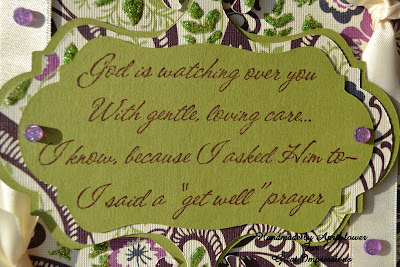 One of my fave things to do is think up a sentiment to go with an image. Something beyond the norm to get a little smile. And who doesn't get dumped on every now and then? My truck is colored with my trusty Copics and then "filled" with imitation sand. Really, I used sand paper again. Thinking I may need to replenish my DH's supply. October Afternoon's Sidewalks collection as my DP. Some silver shiny brads are added to give my wheels some sparkle. Then I popped up the truck and lower sentiment on dimensionals. I really enjoyed creating this little ditty for you! I hope everyone had a wonderful weekend. I am pre-writing this post as my fiance will be getting in sometime early Saturday morning. I have no clue what I will be doing this weekend. 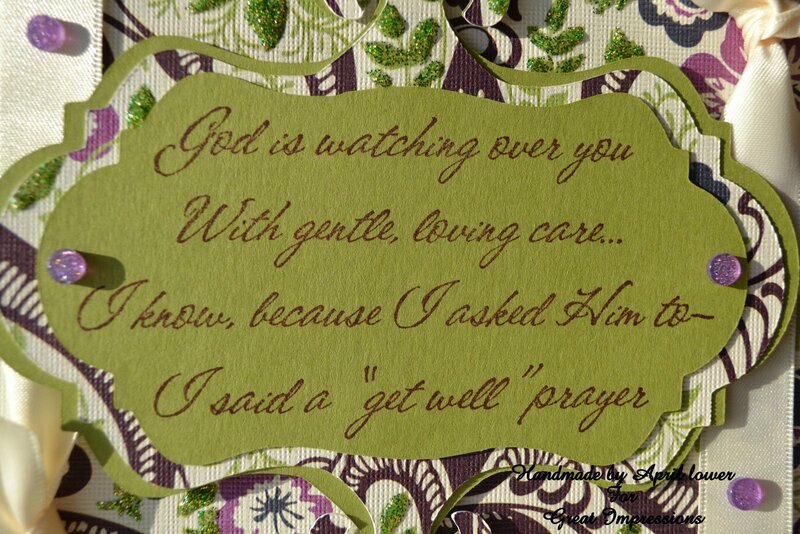 So I thought this card would be perfect to start the week off on a good note. Of course the image was colored with copics and the sentiment was punched out with a Stampin' Up punch. I cannot remember it for the life of me. I used some silver ribbon from a ribbon assortment I got a while ago. The paper pad is an older one from My Mind's Eye. 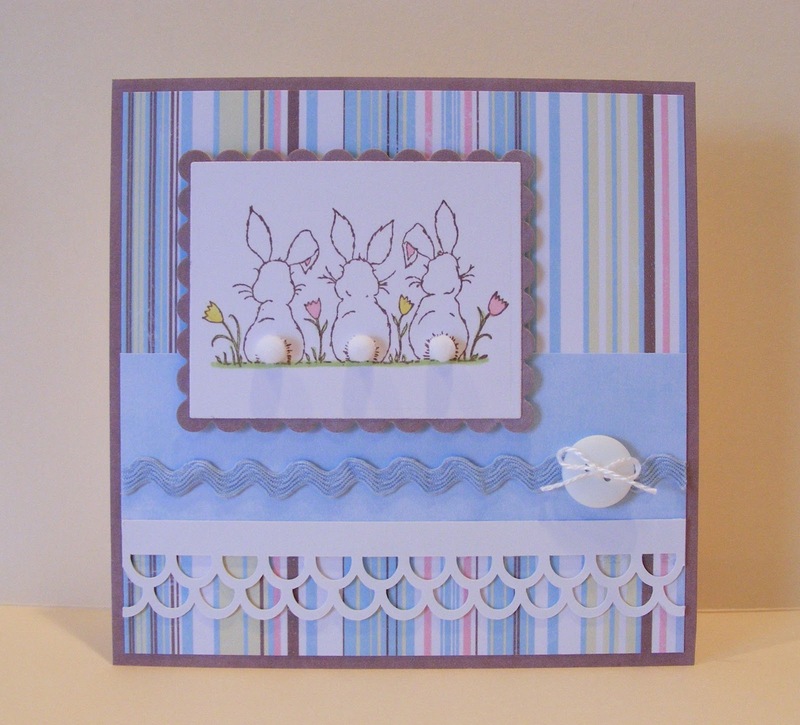 I know this is a quick card to make. 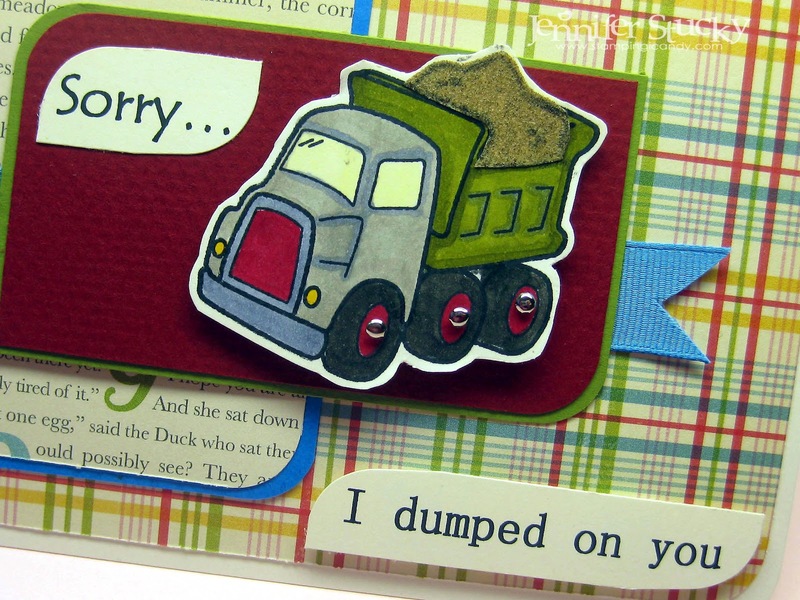 I made it knowing my fiance was coming home and thought this would be a good make someone laugh or smile card! Have a great Monday and check back tomorrow to see what Jenny has for you. Now go out and make a Great Impression! 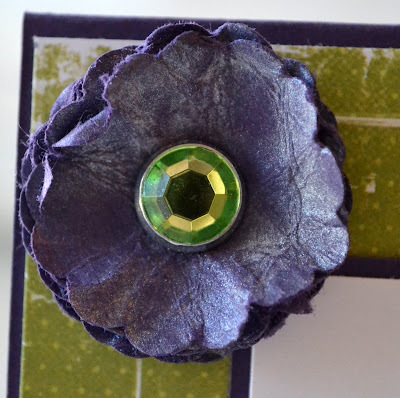 So I am actually sitting here in ADVANCE this week getting my post together! I dont' know what has been going on with me and I normally hate when someone procrastinates (my husband...lol) but for some reason it has been me lately waiting till the last minute to get my stuff done and it's driving me nuts. 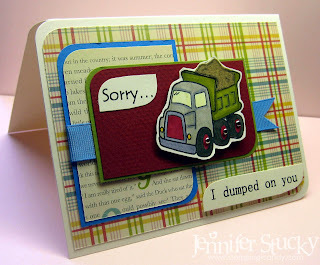 As you have probably already seen...our DT challenge this week was a sentiment ONLY...and some of the girls (including myself) were finding that challenge a challenge for sure! Thankfully I have this nice big sentiment so I didn't have to try to figure out what to fill the space on the card with!!! I used Get Well Prayer and got out my cricut and did some cutting!!! 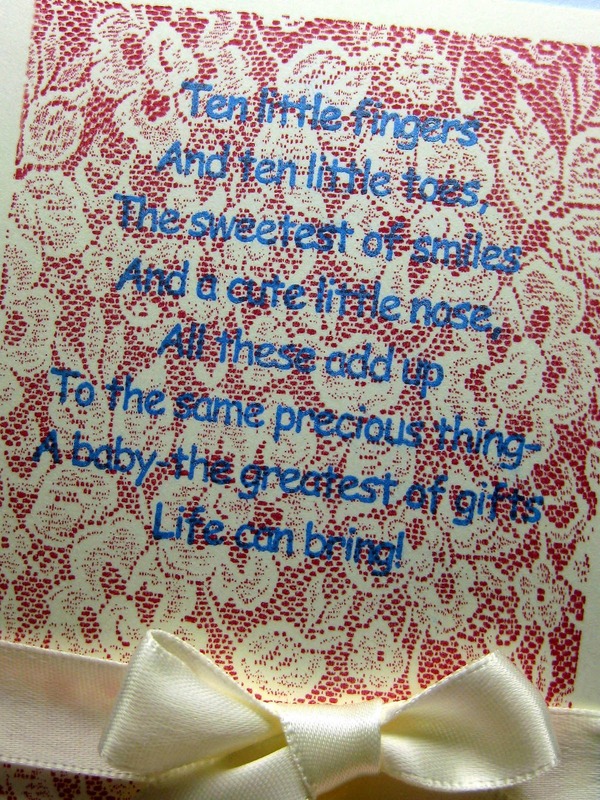 I got lucky that I was able to make it just the right size so it fit the card and the sentiment! 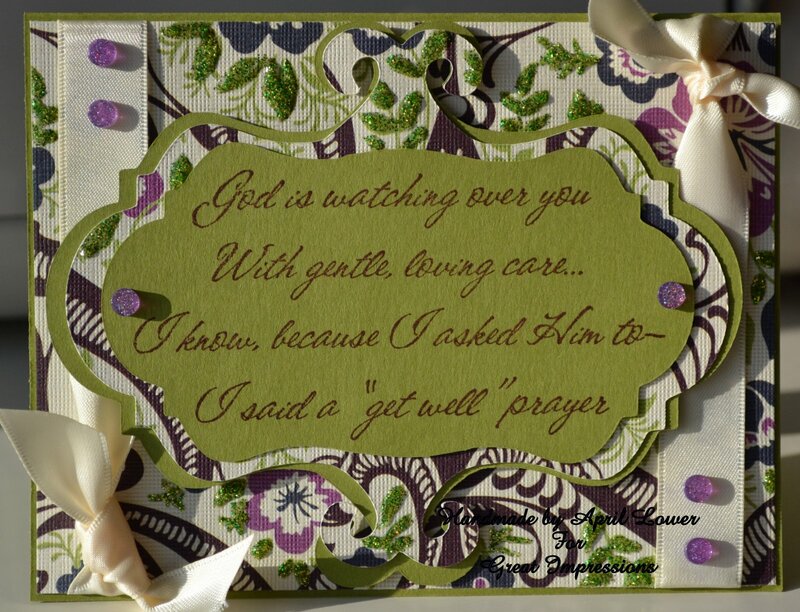 I don't do a lot of get well cards and people ask me all the time for them and I might do a few more with this sentiment...it just seems perfect! Just in case you didn't notice...on the sidebar----------> you will find the discount code for the store and there are only a few days left in Feb. so hurry on over!! Hi, Everyone! Angi, here...with another failed attempt at a CAS (Clean and Simple) card! Don't worry...it doesn't really bother me. I have way too much fun playing with techniques and trying to figure out how to get the most out of my art stash - that includes my Great Impressions' stamps! I have a lot going on this week and really did attempt a simpler design, but alas, the paint called my name and I answered! 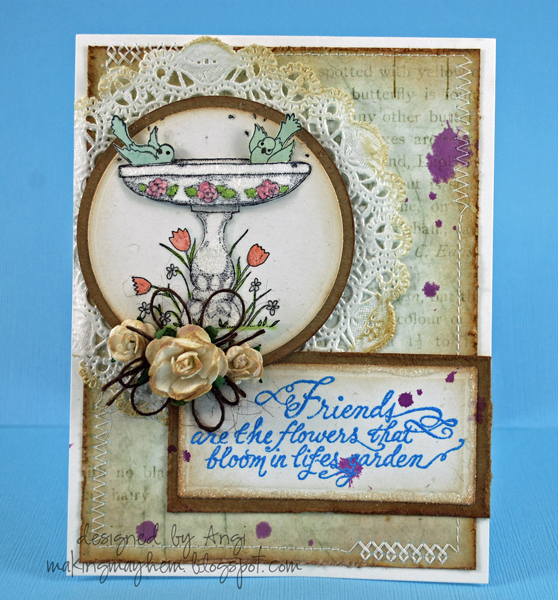 The 'Sentiment Only' Design Team Challenge was a difficult one for me...only a sentiment?! then an embossing folder, a dab or two of white paint and some stitching...with a little vintage lace (can one have too much tatted loveliness?) and the odd button, two or three thrown in for good measure! 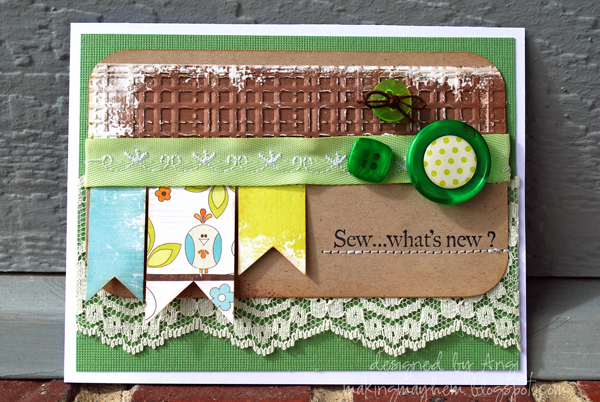 Sew...what's new with you? 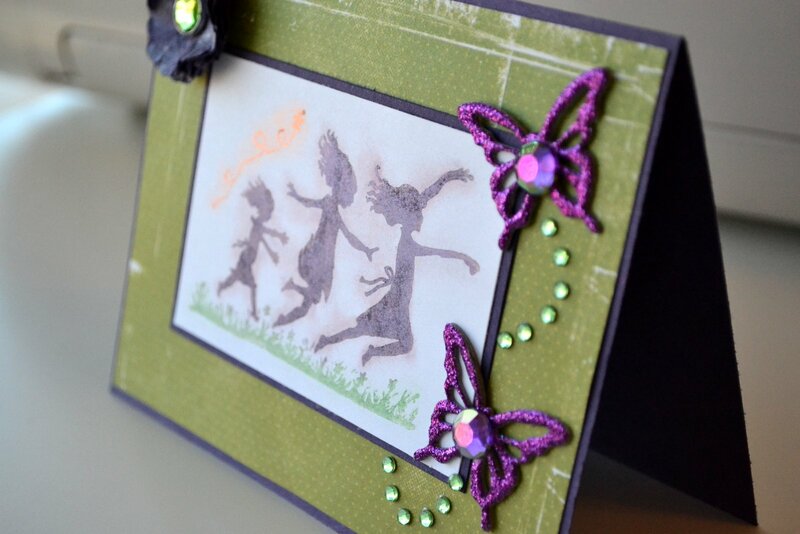 We'd love to hear about the Great stamping you've been doing. If you've taken the time to leave us a lovely comment - Thank you! We appreciate the feedback. Make sure to follow the Great Impressions' blog, so you don't miss a thing...and we don't miss you! Boy...am I going to be in trouble if we ever really do a CAS challenge...hope you find some time this weekend to get your craft on! Labels: Angi , C420 , Design Team , Whats new? 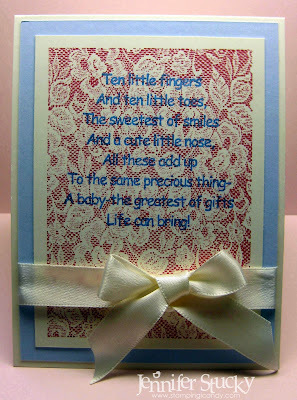 The Great Impressions Design Team is making cards this week with the theme "Sentiments only". 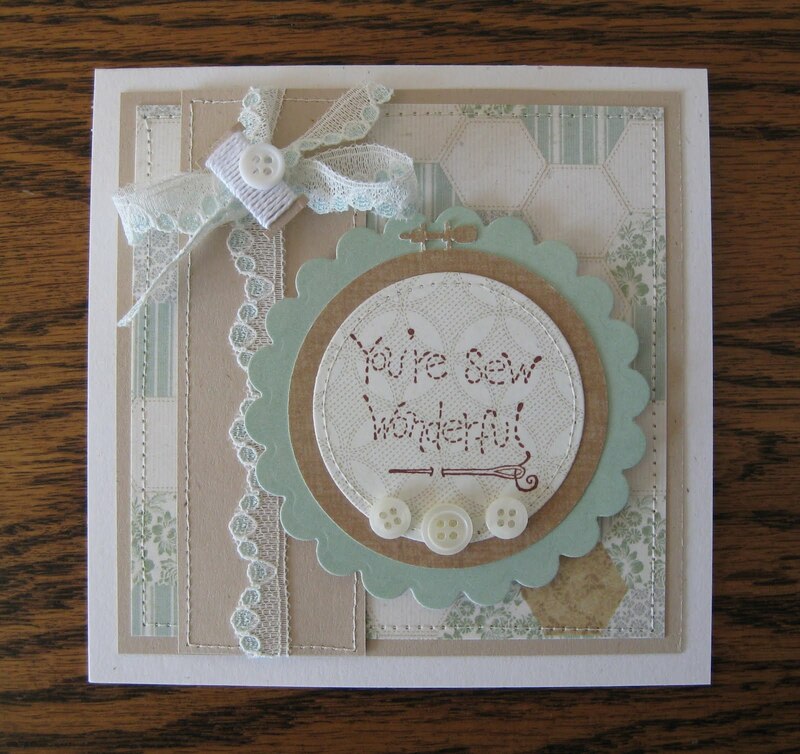 I have several friends that like to sew and thought this would make a nice thank you card. Welcome to the beginning of a new week. I hope everyone had a fun and loving Valentine's day. I was all by myself with my little sicko. But let's not talk about that. Have you been by to check out the store and do some fun shopping? It's open now so hurry and go see! I hope your getting ready for March's Stamp of the Month. Some fun images are about to come out. 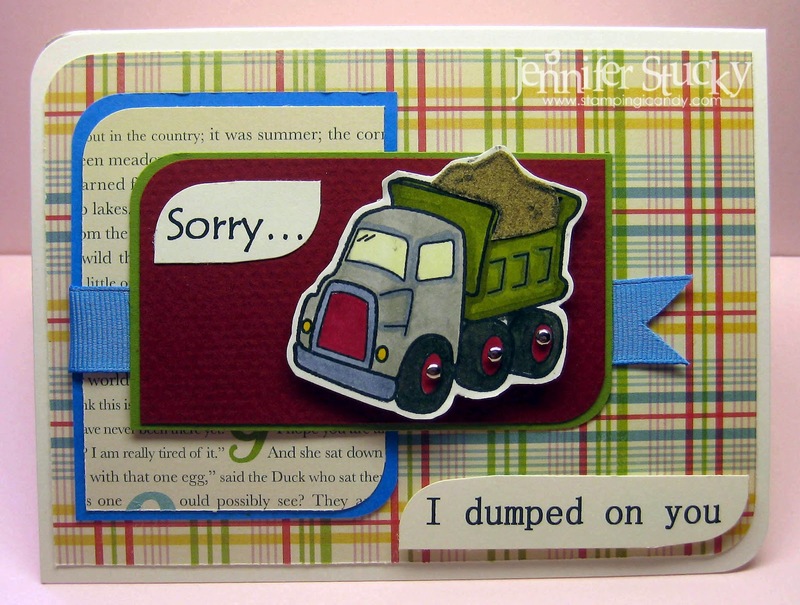 For now I have a cute and simple card for you. 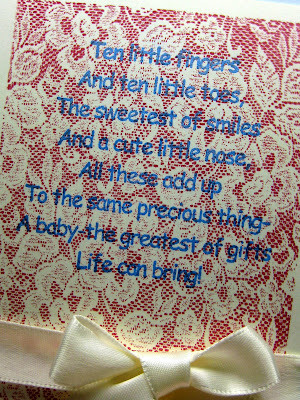 I used plaid ribbon, spellbinder scalloped square, red apple embossing powder, and Lily Bee papers. Come by and see us tomorrow. Don't forget to make a Great Impression. 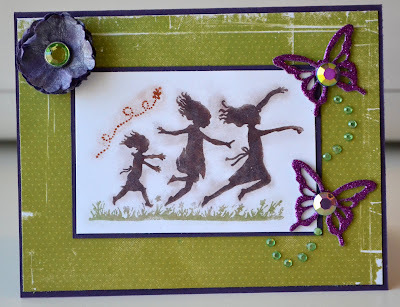 Today I worked with Frolicking Trio...this is one of the first stamps I got because I loved the image but I don't work very much with silhouette's so I was a bit out of my comfort zone. Then I remembered I had perfect pearls and decided to see what I could do with them! I inked up my image first with my versamark pad and then got out my perfect pearls and paint brush and went to town using 3 different colors. 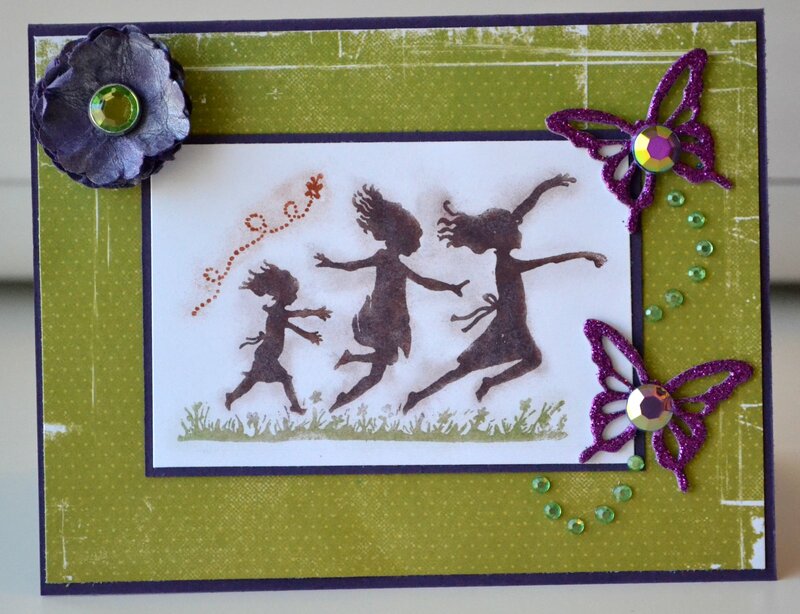 For my first try at this I think it came out pretty well although you can see a bit of a shadow around some of the girls and it wasn't suppose to look like that but if your not a stamper...you might think I was "trying" to make a shadow...lol! Simple. Unadorned. No frills. No matter my intentions, I have a difficult time creating simple cards. Today's card is no exception! Now that Valentine's Day is over I can start thinking ahead to more Spring themed cards...lucky me that February's Stamp of the Month stamps made this an easy shift! 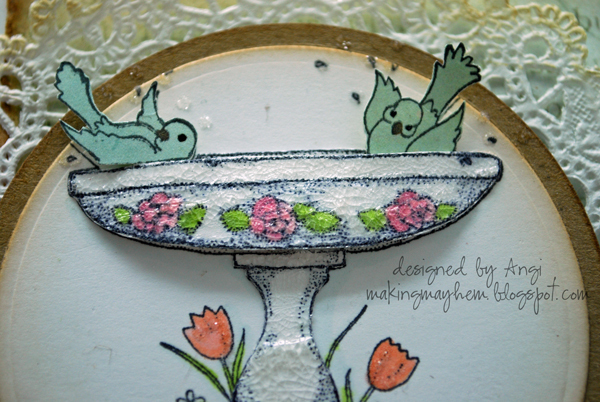 The two stamps I used on this project are Spring Bird Bath (F519) and Friends (E748). Basically, I stamped the image 4 times (once on scraps for the birds), cut parts out of 3 and layered them to give the image more depth. These birds are so darn cute! Frolicking comes to mind...don't you think? Okay...don't want to keep you too long today...get comfortable, click on over and take a look around...you won't be disappointed - there's even a wish list feature you can use once you sign up!